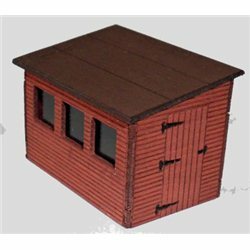 This kit contains all the components needed to build a model of a wooden garden shed measuring a scale size of ~10 ft x ~6ft. The shed has three glazed windows in one side, a single door and a sloping roof. All the parts have been accurately pre-cut from wood by laser and are fully etched. The walls have interlocking corners, making for easier assembly.